When Challenger Motor Freight joined the US Environmental Protection Agency’s SmartWay Partnership Program in 2006, the company was already actively managing its fuel consumption. You don’t grow a company from a single truck to having a fleet of roughly 1,500 without knowing your costs—and fuel represents one of the largest costs for any trucking company. “Fuel economy is something we measure every day. We have meetings on it. It’s such a huge cost that you need to stay on top of it,” says Mario Da Silva, director, corporate services for risk with Challenger Motor Freight. In addition to managing risk, Da Silva is also responsible for fuel purchasing, so he’s very much aware of the impact fuel consumption has on the company’s bottom line. Not only is reducing fuel consumption good for business, but it also benefits the environment, since every litre of diesel consumed produces approximately 2.7 kg of CO2. While Challenger has always been cognizant of its fuel spend and has continuously sought ways to reduce its consumption, going through the SmartWay verification process proved to be a useful exercise, Da Silva says. The program provides handy tools to calculate a carrier’s environmental footprint and through benchmarking, offers insights into how a company measures up against its peers. In addition to benchmarking and providing access to analytical tools, SmartWay membership has other advantages, such as helping to land new business from like-minded corporations looking to reduce the environmental impact of their supply chains. Ikea, for example, requires all its carriers to be SmartWay-certified. Not only that, but carriers must also meet Ikea’s stringent IWAY standards, which take into account everything from a company’s environmental performance to its worker health and safety programs. The IWAY program involves annual audits, including site visits from Ikea personnel, who ensure its suppliers and transportation providers are doing everything they claim to be doing. While this heightened level of customer scrutiny may seem excessive, Da Silva says he welcomes the process because all carriers that haul Ikea product are subjected to the same standard. And it has been good for business. Challenger is now one of Ikea’s largest Canadian transportation providers. Of course, that relationship never would have begun had it not been for Challenger’s involvement in the SmartWay program, which is a prerequisite to doing business with Ikea. Ikea isn’t alone in demanding more accountability from its transportation providers; other large shippers as well are asking what carriers are doing to minimize their environmental impact. Challenger has created an infographic that shows its various fuel-saving initiatives, including its use of long combination vehicles, its anti-idling policies, aerodynamic trailers with side skirts and the use of fuel-efficient power units. Even the mud flaps have received attention, with flow-through designs that allow air to pass through the mud flap, eliminating wind resistance, while water and debris is captured and redirected. 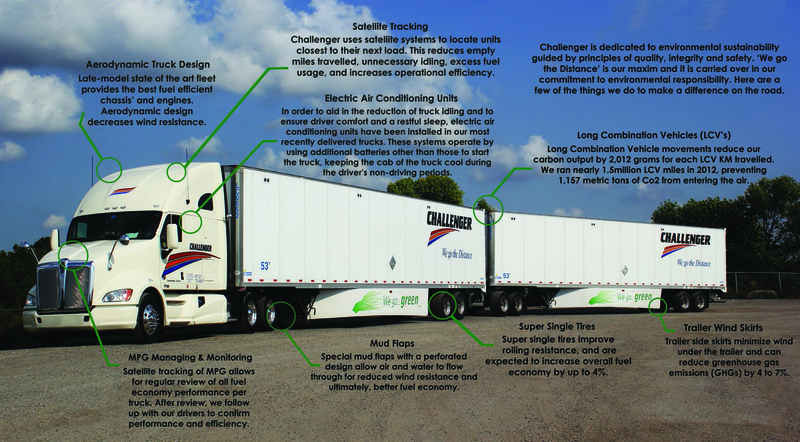 Challenger’s commitment to fuel efficiency goes beyond the on-highway equipment it operates; it also uses the latest routing technology to reduce out-of-route miles and to ensure drivers are being dispatched efficiently. Driver and equipment performance is also monitored, practically in real-time, and drivers or vehicles that aren’t meeting expectations are quickly identified. Sometimes a driver requires some extra coaching on fuel-efficient driving techniques while other times a truck requires some additional maintenance to achieve its fuel economy expectations. Driver scorecards are generated, which compare the fuel efficiency of each driver to that of their peers who are pulling similar loads using similarly spec’d equipment. To remain a SmartWay carrier, members must re-apply each year using the previous year’s data. This helps ensure carriers are keeping up-to-date with their environmental commitments. While SmartWay’s application process may seem intimidating—especially to smaller carriers—Da Silva says it’s manageable and the benefits apply equally to small carriers as well as large ones, such as the Challenger Group of Companies, with its 1,500 power units. Once a company has taken the plunge and committed to the SmartWay program, it not only elevates the carrier in the eyes of its customers and potential customers, but also of its own workforce. In addition to being a SmartWay member since 2006, Challenger has won SmartWay awards of excellence in 2008 and 2009. The company has seen impressive results since becoming a SmartWay partner, significantly lowering its fuel costs as well as its emissions output. Some of these achievements were highlighted in a recent SmartWay case study produced by the Supply Chain Management Association, using 2012 data. James Menzies is editor of Truck News magazine. He has been covering the Canadian trucking industry for more than 15 years and holds a CDL. Reach him at james@newcom.ca or follow him on Twitter at @JamesMenzies.